A disease that is transmissible from animal to human is known as a zoonotic disease. As a veterinarian, it is not only my responsibility to properly diagnose pets, but also to inform pet owners about potential diseases they can catch from their dogs. Below is some information about some of the more common zoonotic diseases that I have diagnosed in dogs. If you suspect you and/or your pet have been exposed to any of the following, seek medical attention right away. 1) Toxocariasis: This disease is caused by a common parasite in animals, the roundworm. Anyone is susceptible to contracting this disease, but we find that children and people who accidentally eat dirt are at higher risk. Animals that have roundworms will shed the toxocara eggs in their feces, and when infected dirt is ingested with these eggs, people can contract the disease. In animals, toxocariasis can cause organ damage, respiratory disease and eye problems including visual deficiencies amongst other symptoms. Toxocariasis can be prevented with good hygiene and a regular deworming program, set up by your veterinarian, for your pet. In humans, toxocariasis will generally resolve itself because the larvae can’t mature in a human host. 2) Ringworm: Ringworm is a skin disease that can be transmitted to people from multiple different types of animals. It is caused by a fungus and typically results in skin lesions that are red, itchy and crusty. Ringworm is transmitted by direct contact from an animal that is infected. If your animal has a skin lesion, it is important to see your vet quickly to properly diagnose the cause of the lesion and avoid potential exposure to ringworm. 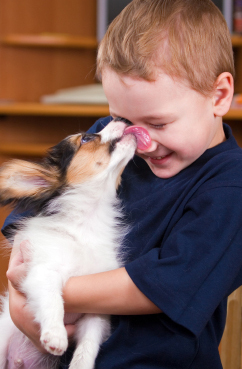 In humans, ringworm is typically treated with topical or oral anti-fungal medications. 3) Rabies: Rabies is a viral disease that can be carried by several different species. Though more common in wild animals, dogs and cats are potential carriers of the disease. It is typically transmitted to people through the bite of an infected animal. After a bite wound, it may take people up to years to exhibit symptoms, but generally symptoms develop within a few months. Initially signs may include fever and achiness, but quickly change to include neurologic disease including confusion, agitation, and mentation changes. When neurologic symptoms occur, they generally become fatal. It is extremely important to keep your pets current on their rabies vaccines to help control this disease. It is also important to avoid contact with unfamiliar animals, especially wildlife. Suspected rabies exposure in humans is typically treated with special wound care and a series of injections. 4) Rocky Mountain Spotted Fever: This disease is caused by a bacterium known as Rickettsia rickettsia. This disease is not transmitted directly from your pet to you, but rather by ticks that your dog may carry. If your pet goes out into a tick-infested area, they may carry them back into your home where you could be bitten and contract the disease. Symptoms generally start with a fever, and can include rashes (commonly near arms and ankles), intestinal discomfort, diarrhea, and joint pain. This disease can be serious enough to hospitalize some people, and treatment usually involves antibiotic use immediately upon suspicion of exposure. 5) Giardia: Giardia is a small intestinal parasite that is relatively common in dogs, cats, and humans, among many other species. Symptoms are the same in pets as they are in people and can include nausea, diarrhea, gas, and other intestinal based signs. Some animals and people may have this disease with no symptoms at all. Though the risk factor of contracting giardia from your pet is thought to be small, it is possible and proper precautions should be taken. Because giardia is transmitted by consuming contaminated feces (can be indirectly, for example through contaminated water), it is important to use good hygiene when disposing of your animals’ waste. Usually, good hygiene is enough to prevent transmission of giardia. If your pet has diarrhea, it is important to see your veterinarian as soon as possible. In humans, giardia is often treated with an antibacterial/antiprotozoal oral medication. There are many other possible zoonotic diseases that we can’t address in the scope of this article. With most of them, working with your veterinarian can help reduce risk factors by keeping your pet disease free and on appropriate preventative medication. Pet insurance can be very helpful in keeping the cost of treatment and prevention to a manageable amount, which is why I recommend it to all of my clients.